This is one I’ve wanted to try for a very long time. Lacto-fermenting intrigues me a great deal. It tales very little effort, is safe (if you know a little bit) and doesn't require any energy to preserve or store. I love kimchi, but only certain kimchi. Years ago at the local Asian grocery, Coa Ho, they had small jars of fairly dry kimchi that was salty, spicy, sour and sweet. Amazing. I've tried several since and it wasn't the same. I haven’t gotten around to it before for a couple of reasons. The first was I wanted to find a true lacto-fermented recipe. All kimchi is fermented, but I wanted to find a method closely resembling my lacto sauerkraut. I didn't so I had to improvise. The second was that, although I like eating kimchi, I don’t know what In would do with 2.5 L of the stuff. The answer to that was Christmas. I will gift what I make in excess of my own use. A large bowl full before salt and kneading. Lacto-fermenting is fermentation using the natural lacto-bacillus present on all vegetables. The trick is to make an environment where bacteria that cause decomposition are killed but not the good bacteria. That’s all done via the salt. I have successfully lacto-fermented sauerkraut (a couple time), jalapenos, and roasted red peppers. Pretty much any pliable vegetable can be treated in this way. Cabbage, carrot, greens and daikon all fall in the category. Broccoli and cauliflower probably not so much unless aided by the introduction of whey. You can lacto-ferment pretty much any vegetable. Other good ones to do with just salt are cucumbers, beets and turnips, all preserved regularly in certain cultures. It’s quite an easy process that anybody can do. You simply slice or chop whatever you’re using and then kneading with salt. Kneading is about the right description. is reduced to about 1/4 of original. You squeeze the vegetables with the salt, taking care to keep the pieces whole. In the process liquid exudes from the dry mixture and what started out dry becomes much reduced in volume and very wet. Whatever liquid that comes out is what goes in the jar with the vegetables. The salt kills the bad bugs until the good ones take over. From there they do their magic converting the vegetables on the chemical level. Lacto-fermentation has many advantages beyond just preservation. Lactobacilli in fermented vegetables improves their digestibility and increases vitamin levels. They also produce helpful enzymes as well as antibiotic and anticarcinogenic substances. Their main by-product (the preservative), lactic acid, not only keeps vegetables in perfect preservation, but also promotes the growth of healthy flora in the intestines. This helps us digest everything else we eat more efficiently too. 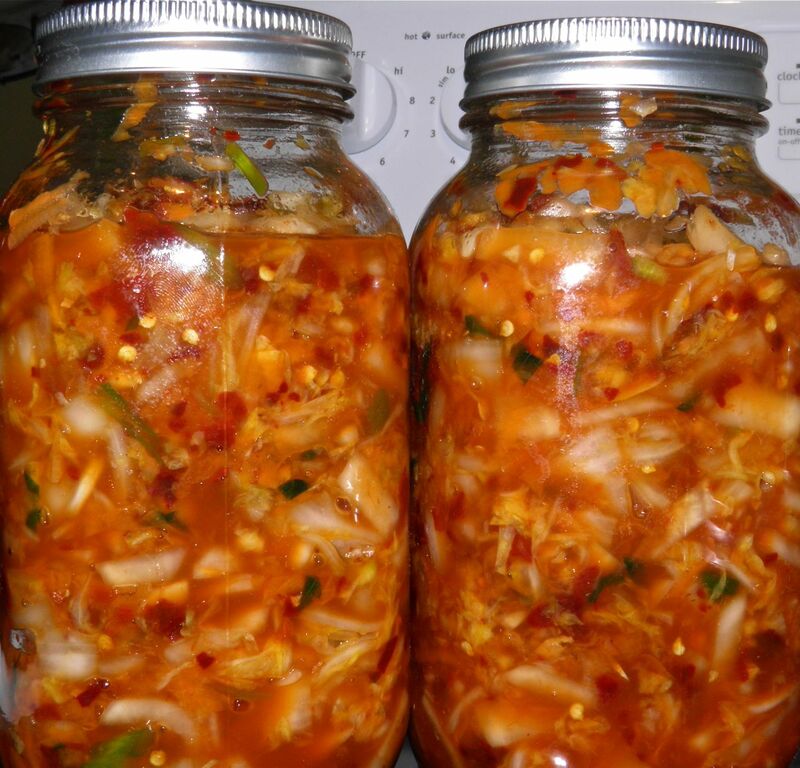 So there’s plenty of reasons to make, and give, lacto-fermented vegetables. It’s such an easy process too. You really should give this one a try. You’ll note the recipe calls for “Korean” chilli flakes. You can buy them, or whole dried ones, in Asian grocery stores. 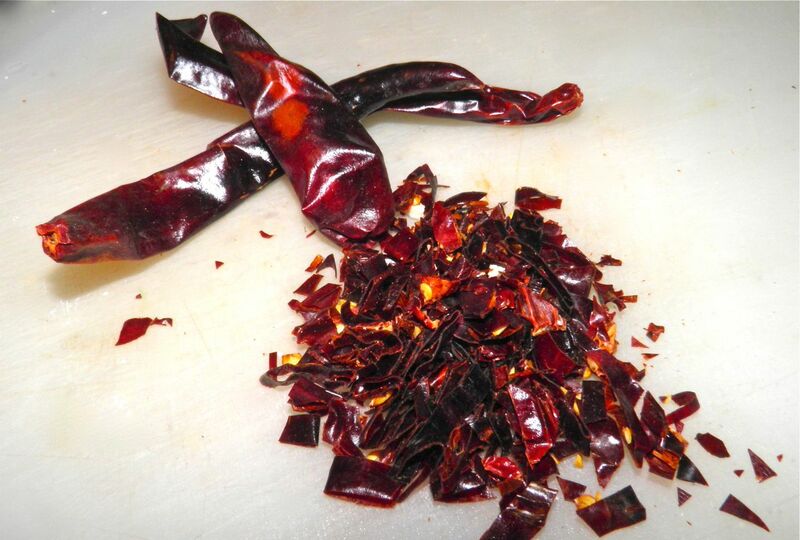 They’re not as strong as regular chilli flakes, so don’t be scared of the 1/2 cup used in the recipe! just love this so I did two 1L. The little one's for me. Prepare all the vegetables and place them in a non-metallic bowl. This is important. Grate the carrot and chop the ginger and add. Then add the red chilli flakes. Sprinkle the salt on top. Wearing the gloves (also important) begin to gently squeeze the vegetables, similar to kneading. Do not break the vegetables up in the process. “Knead” the salt into the mixture for 10 minutes. 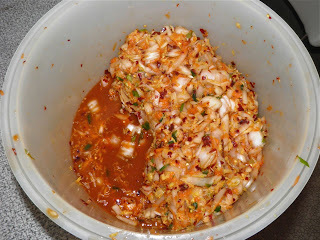 At the end of the time a fair amount of liquid will have leeched out of the Kimchi. Pour the fish sauce over the top and stir in well. Let sit while you sterilize and dry the jars and tops. Fill each jar, leaving about 1” from the top of each one. Divide any liquid remaining between the jars. Carefully clean the top of each jar and cover, tightening well. Place in a cool spot to age for a week or two before use. 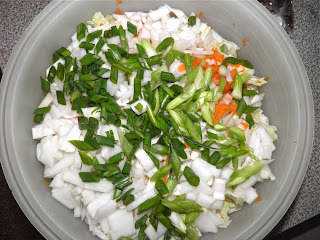 Over this time the vegetables will lacto-ferment and gain a complex sweet/sour flavour. 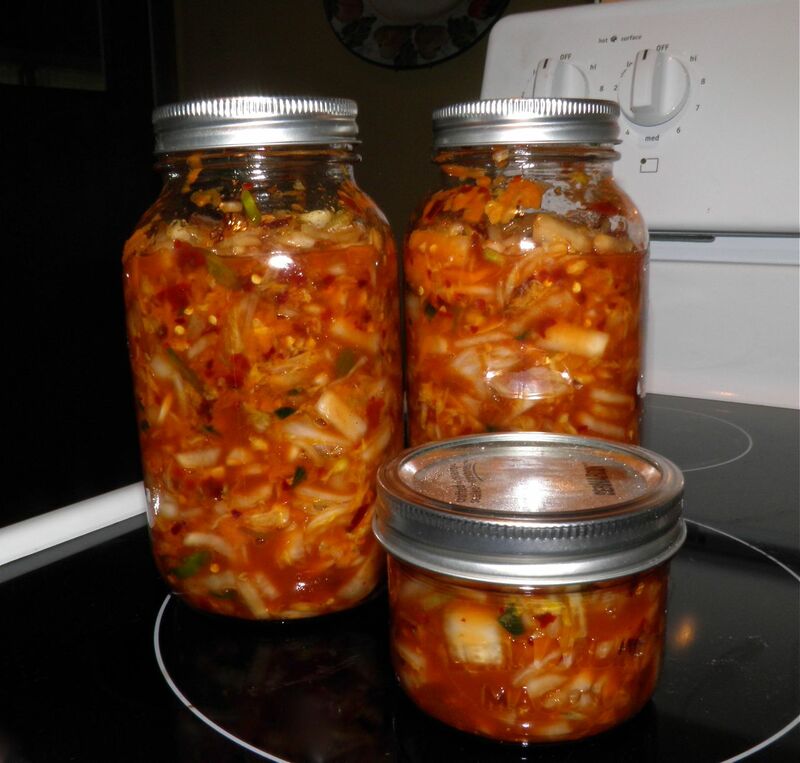 Once opened, a jar of kimchi will last in the refrigerator for a very long time as long as the vegetables remain below the liquid line.